Members of Congress petitioned Secretary of State John Kerry on Wednesday to oppose the recently announced sale by Russia of an advanced missile defense system to Iran, citing concerns that such a move would embolden Tehran’s "pursuit of nuclear weapons," according to a copy of the letter exclusively obtained by the Washington Free Beacon. Russian Defense Minister Sergei Shoigu was in Tehran this week for high-level talks with Supreme Leader Ali Khamenei about a new arms pact that would provide Iran with the Russian-made S-300 missile defense system and potentially new cruise missiles, submarines, and torpedoes, according to sources familiar with the talks. Tehran and Moscow announced on Wednesday that they had inked an agreement to finalize delivery of the S-300 system, according to Iranian state-controlled media reports. The arms deal had been in the works for some time, but hit several roadblocks after Russia reneged on its promise to make good on an $80 million deal enabling Iran to purchase five S-300 systems, which are long-range surface-to-air defense artillery. Now that the deal appears to be sealed, members of Congress are petitioning the State Department to vigorously oppose it, according to a copy of the letter sent to Secretary of State John Kerry. "The potential sale of the S-300 defense system will jeopardize prospects for resolving the Iranian nuclear issue through diplomacy," Reps. Peter Roskam (R., Ill.) and Ted Deutch (D., Fla.) wrote to Kerry. "We remain concerned that the S300 systems would significantly expand Iran’s defense capabilities, potentially emboldening Supreme Leader Khamenei’s pursuit of nuclear weapons," they wrote. There is also concern that Russia’s growing military relationship with Tehran could impact its ability to play a constructive role in the ongoing negotiations of Iran’s contested nuclear program. "While we understand that Russia’s role in ongoing P5+1 talks is critical, we urge you to send a clear message to Russia that moving forward with this sale would undermine negotiations and severely threaten regional stability and U.S. national security," the lawmakers write. Roskam and Deutch first raised the issue with the State Department in September 2013, when reports began to emerge about Russia’s arms deal with Iran. The pressure resulted in a United Nations Security Council resolution calling on Western nations to "exercise vigilance and restraint" over any potential military deals with Iran. Now that the arms deal is back on track, there are concerns Russia could be violating this resolution. As Tehran moves to build up its nuclear program and military capabilities, the threat of U.S. military action becomes less effective, the lawmakers write. "As we mentioned in our previous letter, maintaining a credible military threat should diplomacy fail has always been a vital component of the United States’ policy toward Iran," the letter states. Roskam and Deutch go on to ask that Kerry "remain resolute" in his "commitment to preventing the transfer of destabilizing weapons systems to Iran." 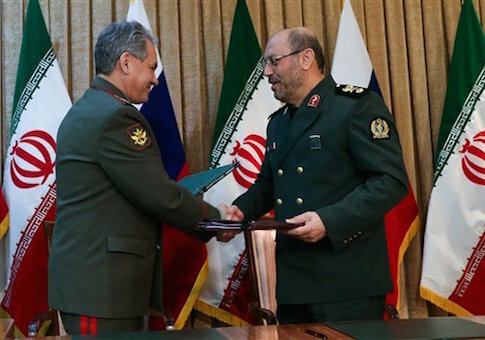 Russia’s Shoigu and Iranian Defense Minister Brigadier General Hossein Dehqan announced the S-300 deal in Tehran late Tuesday, according to the Fars News Agency. The sides reportedly worked out differences that had prevented the sale and further "agreed to broaden their defense cooperation and joint campaign against terrorism and extremism," according to Fars. Russian Foreign Minister Sergey Lavrov on Wednesday praised the growing military ties with Iran after the deal was announced. "Iran is our neighbor, with Iran we are developing very close relations regarding the development of bilateral economic cooperation and military-technical cooperation in the spheres that do not come under the U.N. Security Council resolution," Lavrov said, according to a translation of his comments by the CIA’s Open Source Center. However, Lavrov added that he had "not heard reports that the subject of S-300 was discussed" during the talks. A State Department official did not respond to a request seeking comment on Russia’s arms sale to Iran.